Screenshot from the viral video of the confrontation on the TTC. Earlier this week, a video went viral surfaced featuring an altercation between a woman and young man on the TTC over him putting his feet on the seats. The young man had been resting his feet on the edge of an adjacent seat, when the woman, attempting to make a point, decided to sit on his feet. 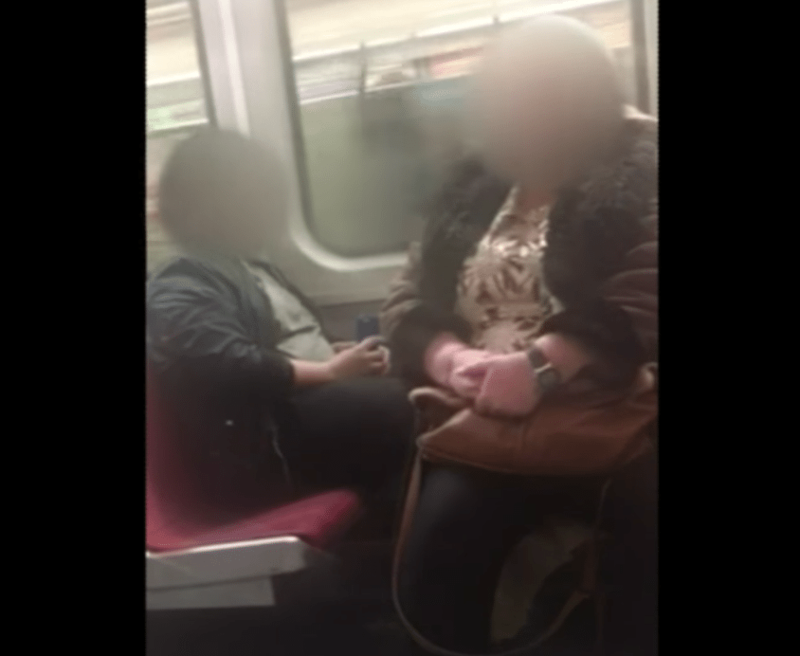 The video has sparked a city-wide debate, was the woman right to take action when she saw a violation of transit etiquette? Many say yes. This incident comes at a time when transit systems and their riders are increasingly talking about etiquette. GO Transit, for example, rolled out an etiquette campaign last year, aimed at educating the public on the dos and don’ts of transit—don’t put your feet on the seats, don’t talk loudly, don’t block the doors, etc. Around the same time, GO announced hefty fines for such etiquette infractions; putting your feet on the seats alone could cost you $150. But the question has to be raised, are these social codes necessary or even effective? For the past six years, I have been commuting into Toronto using GO Transit and the TTC. I’ve seen my fair share of bad transit behaviour, but I’m not sure promoting social codes is the solution; if anything they do more harm than good. Now, there is nothing inherently harmful in these rules. After all, keeping our feet off the seats keeps the seats clean. However, they have the effect of promoting a transit vigilantism that unfairly targets some more than others. People of colour, young people, working class, and poor folks are more likely to be reprimanded for their behaviour from fellow passengers. These interactions can then escalate and involve transit enforcement officers. The question in this scenario needs to be asked—would this woman have assaulted this man if he was not Black? We experience our transit systems not as a public service for all, but as a service we individually pay for with our fares. This helps reinforce an almost NIMBY attitude that defines who can use the service comfortably and who cannot, and it plays out in who gets confronted. So, while a businessman may get eye rolls for talking on the phone, a bunch of teenagers having a loud conversation demands the attention of the authorities. When a person approaches someone about violating a rule, more often than not it’s done because the person feels like their comfort as a fare-paying rider is being infringed upon, not because the public service must be maintained. Keeping seats clean and not occupying seats with bags is important of course, but they are far from the biggest problems occurring on the transit system. Women experience sexual assault while using transit systems and there have been many incidents of racially motivated harassment and attacks, yet these rarely warrant official attention from transit enforcement officers. For many, these codes exist only to protect the middle class sensibilities of some riders, while ignoring problems that affect others. There is a better way to ensure the seats stay clean, and that’s to invest in public transit as a public service again. Money wasted on etiquette campaigns is better spent on ensuring that fares are low and transit is accessible to as many people as possible. When we start to see public transit as a public good that everyone deserves to enjoy, we can start to feel more empathetic and considerate to our fellow riders. Feet would be kept off the seats, but people would also be more understanding; comfort for all would be emphasized over comfort for me. But until then, we can expect more confrontations like this.